I really should have called this recap "Hello/Goodbye", as tonight we will be replacing one much-loved contestant with the worst kept secret in Big Brother history. Let's not sugarcoat this. Jason is going home, and honestly deserves it. I like him. He's a funny kid. But after he was put up to replace Clay this past Monday, he did absolutely nothing to save himself. He slept for most of the day and night, and too much of his awake time was spent with people who can offer him no hope. Unlike a certain segment of the fan base, I don't believe in begging CBS to create fake "twists" just to save somebody I like. Of course, Jason's futility won't be shown tonight. Instead, we'll get a bit of talks he had with Shelli and Clay, along with some phony diary room commentary that indicate maybe, just maybe they should keep him. Then the voting order will be constructed in a way that will make it look like there's a question whether he will be evicted. Don't buy into it. He's dead meat. Ok, enough babbling about what is going to happen. Let's just get this over with. Ooooh, Chen announced that we get an endurance comp...and NO Battle of the Block. My mood has changed!!! So it's the aftermath of Jason's nomination. Vanessa apologizes, and Jason says he has no idea why this happened. "It's not the way I wanted to do it", she says as she walks away. Jason complains how their new alliance was a "bunch of crap", and that Vanessa should have told him why he was up. "I don't need to hear some stupid apology that is as shallow as a puddle." Jason isn't the only person upset. Jackie says she feels like a "total idiot". Well, that should be normal. It's Meg who takes it the worst, though. She immediately starts bawling, which carried on through most of Monday. Becky, though, may be the smartest person in this scene, as she decides to just "lay low". Then again, that's what she's done all season. The sad music comes on as Jason wanders the house, telling the viewers in the diary room how this is his entire life. "I may be blindsided, but there's no way I'm just going to roll over and die." Ugh, well that's what you did, grocery boy. He heads outside, and Jackie asks if this was the plan the whole time. Jason notices that Clay and Shelli aren't upset about him being up. 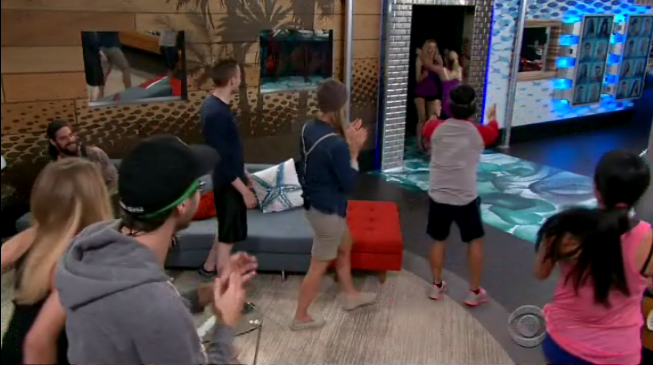 In the extra room, Austin and Liz celebrate. "One more for the good guys." Ugh, come on...especially when the fake air guitar is added. Meg heads into the storage room with Clay, and she asks if he knew. He denies it, but he's not very believable. Of course, this is Meg, so she seems to believe him. He tells her that he believes Austin made her a deal, which Meg says doesn't make sense after the eight-person alliance they created. Yes, Clay is confused. In the diary room, Meg claims that she "needs to get answers". Good luck with that. She then heads up to the HOH to sort of confront Vanessa. Well, actually she breaks down in tears telling her that she was so excited to work with her, but now "I really feel like a dumb girl". Vanessa admits that Shelli and Clay were in on this deal. "If they pretend like they didn't know, that's going to piss me off." Great damage control by Vanessa right here. Jackie now asks Vanessa what happened. Vanessa asks which of the two she can trust more - Jason or Austin. Liz chimes in, and complains how it was Jason who told the whole house that she was a twin. Vanessa adds that the "majority" of the house agreed with this idea, and Jackie point blank asks Shelli if that's true. Shelli denies it, and then sort of backtracks. This is easily the funniest moment of the aftermath of Jason's nomination. "Do I want anybody to go? No!" Vanessa asks Sheli if she backed her on this plan? Shelli doesn't give a very good answer, and Jackie is now pissed at her. Meg now tells Jackie how Clay lied to her face. They've now figured out the sixth sense alliance, and Jackie points out how Clay and Shelli have been behind every eviction. Jason walks in, and they tell him what they've figured out. James also comes in, and Meg starts crying again. As does Jason. And Jackie. Cue the sad music once again! "Stop putting up my people", whines Meg. Now we move back up to the HOH, and Vanessa is pissed at Shelli. Clay joins them, and Shelli babbles something that I still don't understand. Ok, she's actually pissed that the only people who have a target due to the Jason nomination are her and her son...I mean Clay. Vanessa doesn't agree, and says she'll be put up before they will. Shelli counters that the three of them should have had some sort of game plan to answer the questions that would arise. After commecials, we see Jason, Meg, and Jackie outside plotting on how to get two more votes to save him. They wonder which group of two (Shelli/Clay, Liz/Austin, James/Steve) they should go after. The finally decide to "scare" Shelli and Clay that Becky would go after them if she remains in the house. Yep, it's a futile gesture. It's late at night when Jason makes his move on Shelli. Clay also enters as Jason plans to "serve the biggest plate of bull". He tells the pair that Becky plans on putting them both up next week, and will give them whatever they want if they'll save him. "If you save me, you're on the top of my totem poll. You're on the top of Meg's...and you're in a much better spot then being the tail end of Austin's three-headed monster". He's right, but as I said in the preview it's destined to fail. So that's it, as we now go to the house. Wait, we get a Johnny Mack family fluff segment??? Look, I love him, but let's move on. After commercials, it's time for the eviction. Becky gets to make the first final plea, and she thanks all of her friends and family. She says Jason is "wild, but I'm basic". She loves him, but wants to stay in the house. Jason tells them to vote for the person "who will help your longterm game here, and hopefully you'll see that as me". He has "no regrets, just choices". Voting then commences with Austin, who does a somersault on his way to vote to evict Jason. Meg then votes to evict Becky, but Liz votes against Jason. James, though, votes to evict Becky, while Steve goes against Jason. Jackie, though, votes to evict Jason (interesting), as does Shelli, Clay, and John. Yep, Jason is the person evicted this week by a vote of 7-2. Julie announces the news, and hugs Meg and James. He tells them all to "play hard", and is out the door. After the uncomfortable moment of the house watching his picture turn black and white, the interview begins with him being "completely caught off guard" by his nomination. He says he was "real naive" to think their new alliance was real. He says that the night they created it, he felt really comfortable, which is the moment in this game everything always goes bad. He's asked who "betrayed you the most", and he responds that it's Clay and Shelli. "I would definitely say that Shelli is evil personified." YES!!! Vanessa, though, is a "smart game player" in his eyes, and did a "smart game move", but "has more soul". He's then asked why they thought he was such a threat, and he really doesn't know. "Obviously, they see something in me that maybe I don't recognize." Day and him discovering the twins twist is then brought up, and he admits that it was a mistake to not use the info to further him in the game. He's asked about his pals, and they have to start work hard to survive. If there's an endurance tonight, they're going to have to do everything they can to win. "We all know my girl Meg has the jello legs, so she might not be too good at it." He does think she has the best chance to make it further in the game. The goodbye messages are then played. Shelli outs the "sixth sense", and "hates" he was evicted. Jackie says he's the one person who "should have won the game". Liz then acts cocky, saying "have fun watching from mom's basement". Meg says she already misses him, and tosses him a kiss. He ends the segment by saying that he had the entire house figured out, including the evilness of the twins and the sweetness of Meg. With Jason out, it's time to bring Julia in. Now Julia hasn't been switched with her sister in a few days, so she's not sure that she's actually going in the house. Yet she's dressed for tonight's endurance competition, and after delaying it as long as possible, Julie finally lets Julia in on that she's now in the house! She's sent into the house as Julie calls everybody to the living room. Julia is then introduced, and the doorbell rings to Liz hugging her. Somehow, James acts surprised by this "news". Julie then announces that the twins twist is over, as is the Battle of the Block. THANK GOD!!! She then sends them to the backyard for the first endurance competition of the season! It's possible this could go on for quite some times, so get your feeds now!!! Otherwise, what did you think of the episode? Are you happy the twists are over? Are you sad that Jason has gone? Who do you want to win the endurance? Tell us what you think! The whole twin twist thing was pretty boring after Jason and DaVonne figured it out, the whole house pretty much knew anyway. I think Jackie has a pretty good chance of winning this HoH, Becky might also have a good chance, both of them would probably take the risk and go against the sixth sense alliance. I don't really see Austin lasting too long in this comp because he is so large. I was curious as to why they ended the BoB so soon? It really wasn't stirring things up in the house as much as it could of because the heads of households both had to be on the same page with everything and they all worked together, but it ended really soon. Also, do you think they're still going to bring one of the first four jury members back this year, or no because Julia came in? Did anyone else hear Jason use the "f word" before he left?